Valentine’s Day is not just for couples. Some local businesses wanted to make sure single adults have some fun on Cupid’s day too. Come join us for an evening of fun and entertainment. 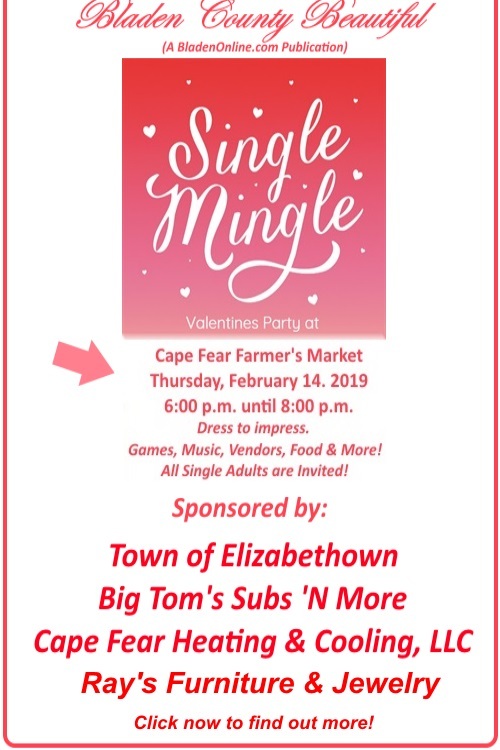 There will be free admission for the first Single Mingle presented by Bladen County Beautiful (a BladenOnlinline.com publication) sponsored by the Town of Elizabethtown, Big Tom’s Subs ‘N More, and Cape Fear Heating & Cooling, LLC. The evening of fun will be held at 106 Martin Luther King Jr. Drive in Elizabethtown at the Cape Fear Farmer’s Market. There will be games, music, vendors, food, drinks, prizes and more. All single adults, young and the young at heart are be invited and encouraged to attend! “The event is sure to be a smashing success. This event will make way for an annual Single Mingle presented by Bladen County Beautiful each year,” Charlotte Smith, Publisher of BCB and BladenOnline.com said. “We would like to thank the sponsors of this event and ask anyone else who is interested in being a sponsor or a vendor to contact 910-879-1029 or email bladenonline.com@gmail.com for more information,” Smith added. Girls Basketball Play-off Projections: West Bladen vs. East Bladen?